The All new and highly sought after Marder III Ausf.M variant by Cyber Hobby. This time the vehicle comes in the Stadtgas configuration and it has incorporated many never been seen before upgrades. That includes a fighting compartment with tremendous interior details, crisp sharp delicate details of the engine, close or open engine-deck cover design to show off the engine, fully equipped driver's control and lots of photo etch for extra fine finishes. No detail is spared from this kit and it's probably the best Marder III Ausf.M ever produced. - Upper hull with authentic detail. - Injection armor plates in "Ultra slim" thickness. - Stadtgas support made from new tooling. - Roof of fighting compartment comes with different bolt details. - Gun shield is produced by 3-diectional slide molds. 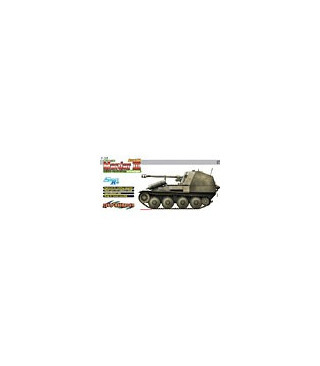 - New gun shield ad recoil guard for PaK40 gun that traverses and elevates. - Newly designed engine-deck cover can be assembled open or closed. - Full interior detail for fighting compartment. - Shell racks finely made. - Option of showing ammunition rounds in rack. - Gun travel lock reproduced with crisp detail. Delicately detailed lower mount for PaK40/3. - Lower-hull frontal armor has crisp detail. - New external exhaust pipe with photo-etched exhaust cover has great detail. - Slide-molded one-piece cassis with delicate details. - Engine-compartment rear panel is sharply detailed. - Periscopes made from clear parts. - Idler wheels are newly tooled. - Sprocket wheels accurately tooled. - Road wheels and suspension with crisp detail. - Engine exhibits delicate details thanks to separate parts. - Weather tarp supports with fine detail reproduced. - Two types of plastic ammunition, shell cases, ammo tubes (Open + closed) and metal ammo cases with decal marking.